It was a chilly, rainy day today and I wanted something to warm me up from the insides out. 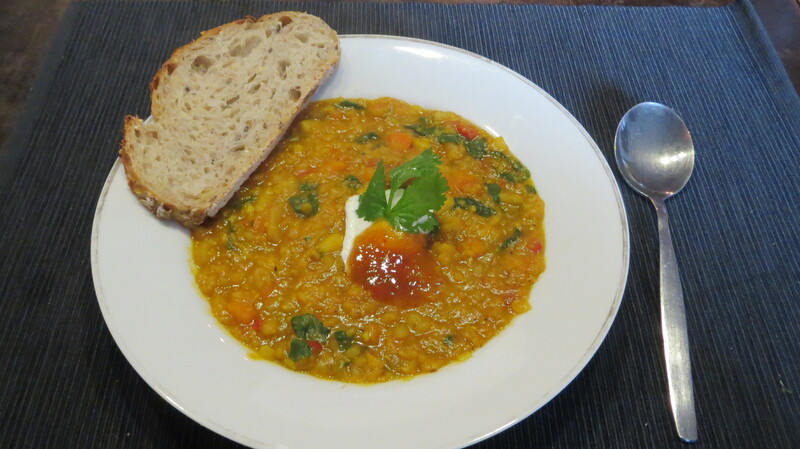 I made this curried lentil and root vegetable soup with the hopes of eating something tasty, healthy and warming. I wasn’t disappointed! This is how it looked when it was finished. Time required: Approximately 1 hour from prep to table. N.B. I couldn’t find my measuring jug, so all measurements are close, but approximate. Sorry folks! Mix stock cube and water in a large pot on the stove top. Slice carrots, parsnips and potatoes into small chunks, roughly the same size. Add to the stock and bring to a boil. 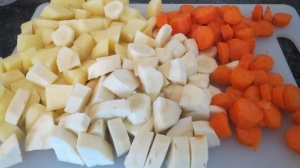 Slice the potato, parsnips and carrots into small pieces, roughly the same size for each. 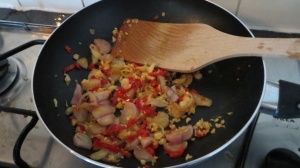 Add the olive oil, finely chop shallots, garlic and chilli pepper and ginger to a frying pan on a low heat and stir. Mmmm, garlic, chilli pepper and shallots. Yes, I used a lot of garlic (well two large cloves) but it was sooo good! To the frying pan, add the chicken curry spice mix, garam masala spice, and turmeric. Mixing the aromatics on the stove top – it smells so good! When the root vegetables are soft, remove the pan from the heat. Using a hand blender or a potato masher, gently and carefully blend the vegetables (I chose not too fully blend the vegetables because I like a more rustic texture). Return the pot to the heat and add in the lentils. Bring to the boil and then turn the heat down to a simmer. 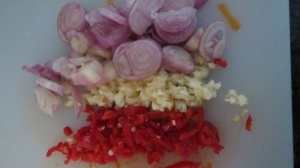 Mix in the contents from the frying pan. Mix in the tomatoes and the coconut milk. Add salt and pepper. Allow to simmer and get thick. 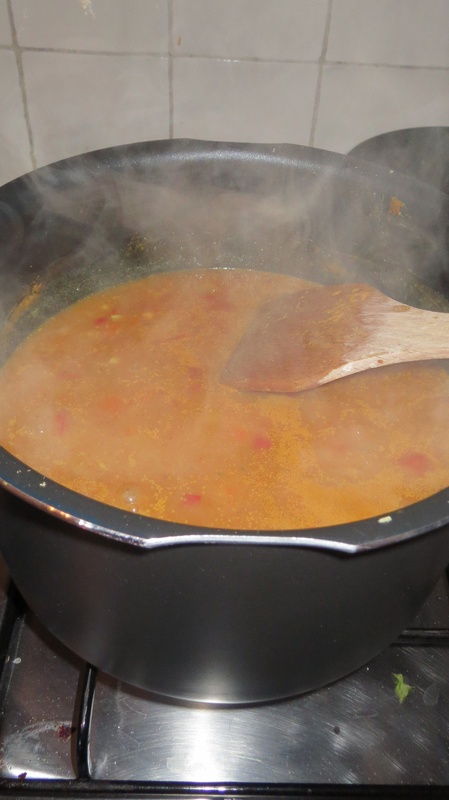 Leave the soup to simmer until the lentils have cooked! Add in chopped spinach and coriander/cilantro. Allow to stew for an additional five minutes. Remove from the heat and spoon into a bowl. Top with a yoghurt, mango and cilantro garnish (optional). Serve with rice, naan or artisan bread (I served it with an artisan sour dough bread with pumpkin seeds, purchased today from the local market).Enjoy! This is how it looked when it was finished! This was super tasty! I ended up adding more salt that I had wanted too, and a fair amount of pepper. Perhaps if I had let this cook for longer, the flavours would have come out more prominently over time and thus required a little less salt. Thankfully there’s some leftover and I’m feeling pretty confident this will taste even better tomorrow!